Another interesting Google Earth network link from those guys in Russia (see credits below). 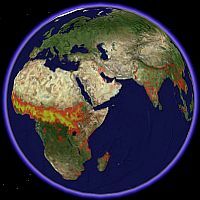 This time they have collected data from NASA and other sources to share with you interesting environmental data showing the status of global-wide fires which rage in various parts of the world throughout the year. The data was collected by NASA's MODIS environmental satellites Terra and Aqua and superimposed on the NASA Blue Marble satellite images of the earth (more credits below). Each sample of data is for a 10-day period, and the Google Earth file can show you any 10-day period since the middle of year 2000 to the present. You should see a reverse chronological list of images for ten day periods of the format 'year''daynumber'. So, for example 2005001-2005010 is the first ten days of the year. You can turn and off these different images to see the fire data. By the way, this is another case where a time-lapse animation of placemarks would be VERY valuable in Google Earth if it were available. But, you could make a movie of the various files, which is what Valery35 has done. He published a Global Fire Movie you can watch in Windows Media Player which shows the fires over time in Google Earth. Very cool! The fire maps were created by Jacques Descloitres, MODIS Rapid Response System at NASA/GSFC and collected by the Geography Department of University of Maryland. Other credits can be found in the original post. Valery 35 is with the GIS department at the Russian Academy of Sciences in Perm, Russia. I've previously written about Google Earth network links he's done tracking birds, World Designer, KMLer, and his very useful Tranportation network link. Yet another great one Valery35! You can see their Google Earth site with lots of interesting applications. I see that Thailand is covered in red. But I've never seen a wild fire here. What I do see is the controlled burning of stubble in the rice paddies. This should be noted, otherwise the info might be seen as more alarming than it should be. The data does not represent wild fires only. It just detects fires from space. this is really cool. In Al Gore's new movie, the '' truth he showed a picture like this.